Myth is the sea on which the Fantasy story floats. Legend is the wind that drives it. Its place of birth is the Fairy Tale. 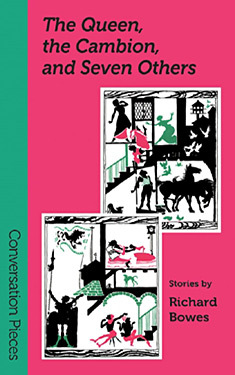 Richard Bowes' collection of modern Fairy Tales, their Fantasy offspring, and their legendary ancestors presents eight of his stories including "The Lady of Wands," in which a Fey cop tells her story, that appears here for the first time. Also original to this book is Bowes' afterword, "A Secret History of Small Books," which traces the path of Fairy Tales as a refuge for women, gay/lesbian writers, and LGBT readers from the 17th century on. The collection also includes "Seven Smiles and Six Frowns" a story of the evolution of a Fairy Tale; "The Cinnamon Cavalier," a Fairy Tale variation a critic has called, "The Gingerbread Man, writ large," and "The Margay's Children" a modern take on a "Beastly Bridegroom" tale; "The Progress of Solstice and Chance," with its complex sexual relations and invented pantheon of gods, the outrageous situation and characters of "The Bear Dresser's Secret," and the "The Lady of Wands," set in a fairy/mortal demi-monde; and two Arthurian tales, "Sir Morgravain Speaks of Night Dragons and Other Things" and "The Queen and the Cambion" in which the eponymous queen, though famous, is not Guinevere.